An hour jaunt up I-43 will land you in Sheboygan, WI, a stylish lakeside neighbor with maritime charm. John Michael Kohler (Gilded Age Wisconsin industrialist and famed namesake of fine toilet and faucet fixtures) felt Sheboygan, at population of 15,000, had too many people a decade into the 20th century to have room for his factory. Cuddled by a patch of forest a few miles away, Kohler, WI became the cradle of iron castings, guiding water through America’s homes and beyond. The Kohler estate stayed active in Sheboygan and opened the John Michael Kohler Art Center 1967. Completely remodeled during the early 2000’s, the JMKAC greets visitors with a reclaimed historic facade of the town’s library, now serving as a gateway into JMKAC’s modest concrete sculpture garden. In the JMKAC gallery space, Animal Magnetism shows its last artwork selection in the exhibition entitled Animal Instinct: Allegory, Allusion and Anthropomorpism. Animal Instinct suspends tremendous visual interpretations of animals interacting in their natural habitat, with humans and the human imagination. Multiple artistic techniques and styles represented challenge the viewer’s reality often. Several large John James Audubon encyclopedic depictions of North American wildlife, from the Milwaukee Art Museum collection, highlight the Animal Instinct installation. Although Audubon sat as a foremost anthropologist of his time, his work through today’s lens appears to project human anxiety on his subject matter. With this tendency, Audubon readily cohabits with the mostly impressionist and surrealist presentations currently found at JMKAC. Animal Instinct also contains selection of excellent contemporary art pieces. Possessing similar affect to Audubon’s, George Boonrujy inks extraordinary illustrated portraits of animals. Rendering them absent of their habitat, Boonrujy, with or without intent, subtly personifies his impressions of animals surviving life. An artist with Wisconsin ties, Gina Litherland overtly weaves animal life into her graphic story telling. Through her chosen medium, improbable interactions with human beings take place that Litherland makes seem mundane. In the adjacent gallery, Animal Magnetism transitions into the next JMKAC exhibit Hiding Places: Memory in the Arts. In addition to professional artists, Hiding Places notably calls attention to work of self-taught artists considered by medical standards psychologically impaired (or gifted). Capturing the ruminations of artist savants, Hiding Places allows entry into forbidden mental spaces of several contemporary artists. New York artist William Powhida shares small pencil sketched faces of Everyone [Powihida has] Ever Met from Memory (that [Powhida] Can Remember). You might not care to know the guy that his female roommate brought around that he wanted to beat up, but surely some of the characters sketches that accompany his sketches will provide mild amusement. For ponder, Gregory Blackmon visually gives a Complete Musical Review of the Augmented Triad Chords, along with other illustrated lists of boats, planes, six-legged pests, and pit-bulls. Several other mental feats, among others, positioned for view are the works of Mark Fox who kept lists of popular cereals and t.v. lineups and attempted to draw, cut and 3-D collage everything that he ever owned. Wisconsin native George Widener devised and meticulously illustrated a method of picking out dates falling on Friday, on which interesting things will happen. A host of additional mind-boggling Widener works address infamous dates in history, all oriented around numbers and thoughts chronicled in tiny penmanship covering every corner of the paper. The John Michael Kohler Art Center (608 New York Avenue, Sheboygan) is not to be confused with the Kohler Design Center (the toilet museum). However, the Kohler folks made sure the bathrooms at JMKAC were pretty impressive too. Significant, road construction prevents access to the JMKAC from 6th Street. Gain access to New York Ave from the downtown side, on 7th, where you can park complementary for 2 hours, and 25 cents an hour thereafter. Animal Magnetism closes June 5th, 2011. Hiding Places: Memory in the Arts officially opens June 26th, 2011. With significant inspiration present, growing an idea requires little space. Mark David Gray curator and resident artist of splashing new Studio 420b whips up his creative gumbo with this recipe. Born of a workspace less than 300 square feet, the gallery’s loosely carved and ample surface area now allows for nooks amenable to his artistic companions. The raw and utilitarian stance of Studio 420b suits the theme of its current installation New Work. Adding intrigue to the theme, concrete floors hoist a sign proclaiming “All Hail Marx and Lennon” scribed in sharp-edged block letters emphasized with a profile portrait of the late John Lennon designed in pastels. It happens that one of the gallery’s artists is a Marx, Lindsay Marx. A 50 times removed cousin of those other great Marx, using oil on canvas, Lindsay Marx explains her impressions of moments suspended by photography in the 1960’s. Her paintings adjust our perspective close enough to see the profoundness of mundanely human dramas beckoning attention, drowned out by the turmoil typically associated with the era of social change. Layering color tones, motifs, concepts and patterns, pictures of moments transform into paranormal events revealing unseen forces acting at that moment. Employing the same technique, other works divine the thoughts of the central subject matter. Exquisite, modest and sometimes eerie, Marx evokes all three with appreciated intent; nothing here perceived as weird for weird’s sake. Perforating the main wall space, a series of small geometrically identical frames house intricately drafted illustrations by Sean Bodley. Having even the negative spaces amazingly formulated solely from strokes of a pen, Bodley demonstrates the art of constructing worlds on a fantastic scale. Glancing at craggy cliffs appearing inches tall you may notice minute human forms that, from their point-of-view, immediately and epically magnify everything around them to Grand Teton scale. Admittedly, Bodley relishes the fantasy genre brought mainstream by the Lord of the Rings motion picture trilogy. Executing with marksman precision, Bodley charts detailed maps of places existing somewhere between Milwaukee that place Atreyu tried to save, and River Styx. Expressing interest in the fantasy genre’s friendliest format, one of Bodley’s artistic channels transmits his current work in an illustrated novel entitled Guardians of Gaia. Too busy settling the West or snatching what they could by guile or force, turn of the century rugged individuals had little time for art, unless they were making “Wanted” posters. Mark David Gray pays tribute to the period of settlement and gunslingers with several of his pieces currently covering Studio 420b walls. Ruddy sepia tones infuse age and subdued neon highlights kick pop appeal into visual renderings that pluck Teddy Roosevelt out of historical archives and place him into new contemporary interpretations. Bigger than the dimensions of the canvas that carries them, several of Gray’s precise works idolize the former President in an endearing but kindly mocking fashion. Others works more straight forward, do plain old justice to the man and the legend. Lacking remissness, Gray offers additional odes to other men or legends fitting the phonetic description “Marx” or “Lennon” for further ponder. Treading a rare path, Gray’s serious demeanor betrays his engaging and open mind and manner; a mastermind behind a space that is truly hospitable to creativity. 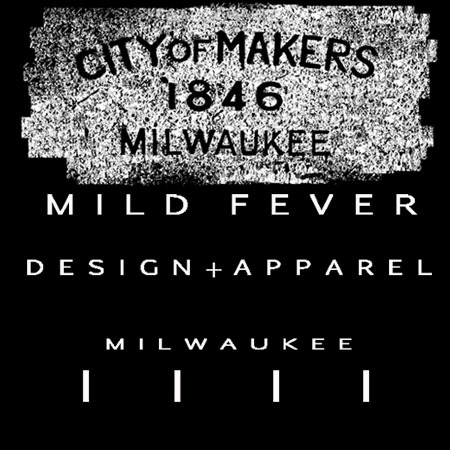 Milwaukee is fast going the way of “scenes”, yet here people come as they are, and work as they are. Through its atmosphere, Studio 420b takes the bit out of the mouth of being an artist. In the process, truly phenomenal art ferments.